It's All About Books: Random Thoughts About Recent Issues and Etc. Why is it I always miss the good stuff!? Wow, the excitement flying around the blogs and the author spots and the Goodreads this week! And I only know about it because you tweet and I click and then the things I learn... oh boy. So just in case you wondered, this here book blog is for me to share with you my love and passion and excitement for books and reading and authors and anything else that makes me happy. I will not be objective because I will be full of my opinions, what I think and what I feel, which, as you all know, is usually positive, maybe even to a fault. But sometimes it might not be, and that's okay, as long as I'm not viscous, something I can quite honestly guarantee I'll never be. Perhaps what I do here, when I tell you about the things I read, shouldn't necessarily be called reviews, but more like reactions or responses. They also won't be so called professional either, sad to say, because I have no clue what I'm doing, even after almost five years. It's just me throwing up words that will hopefully give people a sense of who I am with regard to the books I'm reading. And I don't expect anything in return, well, except for those connections and conversations that I love and long for. That's it. And then what about this SOPA thing? I never heard of it before this week and then BAM! Of course, I don't understand much of it, but it seems to be that it boils down to the government controlling the internet. That sounds so dystopia novel to me that it totally freaks me out! After just reading Delirium? Oh yeah, this is just really scary stuff! Keeping my fingers crossed that in trying to fix something, we don't just make it so much worse. That totally looks like a baking powder biscuit to me. * I'm trying to figure out something very English to serve at book club tonight. I've done trifle before. Thinking scones this time. You know, the real English scones. Suggestions? * I'm yearning for a book that's very similar to Downton Abbey. I heard one called The House at Tyneford by Natasha Solomons would fit the bill. Read it? Yes? I want to read, like, right now! * I cleaned up my bedroom book piles yesterday. Manged to get rid of one knee high floor pile, but there are still three left. And not one spot at all on the shelf. This has never happened before. * People have been talking about Adele for awhile now... I'm finally listening... as in... literally, right now. * Having been on four cruises to date (I know, sad life, huh) this whole sinking cruise ship story has been fascinating to follow and freak out about! Sheesh, I can't even imagine. And only three hours after setting sail! And the captain abandoning ship! What a crazy crazy story! 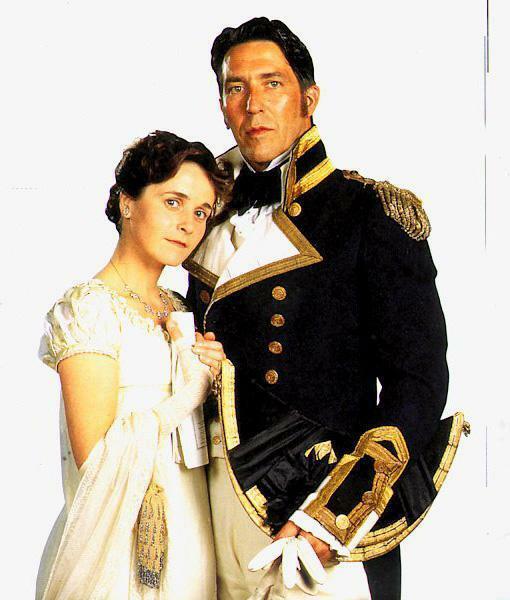 * I watched the 1995 Persuasion the other night, as suggested by a commenter the other day (sorry I forget who.) It was quite different from the 2007 one that I'm a little more familiar with, but I think it fit the book better, especially the ending! But still, I want to re-watch the newer one now too. I mean, I might as well immerse myself I'm thinking! * Yay John Green! Number 1 on the NYT Bestselling list! That's got to be a good feeling. * I really hope you all like the little makeover here on the blog. I'm worried that the tabs are screwy in Explorer... but they look great in Chrome! I'm also worried it's too white and bright, like snow on a sunny day (as I said on a comment reply.) Do you feel like you need sunglasses? Okay well. I better go now. But first I'm going to pound a nail in the wall and hang something. Thanks so much for the recipe link! I think I'm going to go for it! I read about some of that storm the other day. Not a goood start of the year for YA authors -certain ones, anyway. It's a shame because some of the worst offenders in the debacle have their debut books coming out this year. The authors have hurt their own careers before they've even launched. Yeah, it will be interesting to see if this thing keeps going, or dies out. And still, I don't even know all that's going on, just that it's been making bloggers want to defend themselves. um, i have been completely disconnected author/ya scandal, what? downton abbey has me wanting to watch gosford park again. sigh. and wear hats. hope you are enjoying adele. Much exciting scandal! Claws are out! Gosford Park? I guess I should check into that! I would love a hat about right now...can't stand my hair! I hear ya...I learn a lot reading/watching my fellow book lovers on Twitter. Yay for the free flow of info! Amen to that. And good thing we have such well informed, on the cusp of what's happening Twitter friends, eh? I love what you wrote here: "I will not be objective because I will be full of my opinions, what I think and what I feel, which, as you all know, is usually positive, maybe even to a fault. But sometimes it might not be, and that's okay, as long as I'm not viscous, something I can quite honestly guarantee I'll never be." Yes, yes, yes!!! Glad you liked that! I wondered if I should have left that in even, because in some sense, you do want to be objective as a blogger so people can decide for themselves, but I think the whole point of blogging about books is to make our feelings known, which is not necessarily objective, right? I like the new layout tweaks! 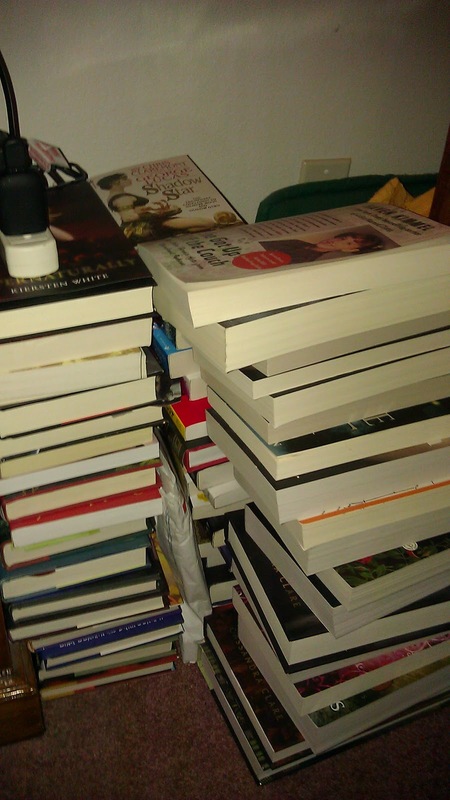 And I love that I'm not the only one with knee-high piles of books in my bedroom. Yeah, those piles? I think they are permanent. Your random thoughts always make me happy :) And the snow on a sunny day look is nice! Well, let's not be too hasty about the scones. We'll see what they really end up looking like! LOL! Now I'm wondering what happened in order for you to post your thoughts on your posts being called reviews or reactions or responses. I live in a bubble, too--I learn most of my information from Twitter as well but I'm not sure that's always a good thing. I feel like I really need to take time to research what SOPA really is instead of just making assumptions based on the hysteria that was yesterday. Who knows. I'm in firefox and the tabs look great. And I have NO idea what Downton Abbey is. Yes, I've heard about it (from twitter) but that's it. Like Trish, I realized why you worded your "disclaimers" as you had. I am going to have to add one, because I have two not-so-glowing reviews sitting in the wings, one a beloved YA, and another by a beloved YA author. sigh. Well, I will be looking forward to those reviews (um reactions?) soon! And thanks for the link... I will come back to that when I have a little more time. Book club calls! You aren't the only one coming late to the party, as I usually find out about the good stuff after the fact! This will blow over, just like previous scandals. I like your layout and the tabs look fine, but it is a little on the bright side. Don't need sunglasses though! No sunglasses huh? That's good then. Yes the stuff will blow over and then pretty soon we'll have another one, probably exactly the same thing too... we're all a little crazy I guess. British food - cucumber sandwiches? I love them. I've never seen scones so small - usually scones are done in a big circle and then scored into triangles, at least around here. Have you read The House at Riverton by Kate Morton? I was reading it while watching Downton Abbey last year, and they were perfect together. Sarah Waters' The Little Stranger is gothic, but post WW2. The recipe Hannah (Word Lily) gave me above does have you do that, a big circle then cut in quarters. So, mine won't look like that picture... since yes, I've decided to go ahead and try that recipe. I will look into the book suggestion. Sounds good! Yes, we're heading in a scary direction. Sausage rolls are always my favorite, they're pretty easy to make, you can use frozen puff pastry and roll out sausage meat. There are some videos on You Tube that give you directions. Maybe I'll have to try those rolls another time! Thanks for the suggestion. Not too white. I like it. Is that Mick from that vampire TV show on CBS last year? Hells yeah!! I like it a lot, Suey. No complaints about it being too white from me. I'm trying to stay out of the author/blogger war (and any other brouhaha) as much as possible this year. But SOPA is bad. That I will pay attention to!